Madrid based band Beat Bronco Organ Trio present their debut 45 on Rocafort Records. Dancefloor ready, Beat Bronco’s two track release gives us Jazz Funk pleaser ‘Easy Baby’, with groove-laden ‘Geriatric Dance’ on the reverse. 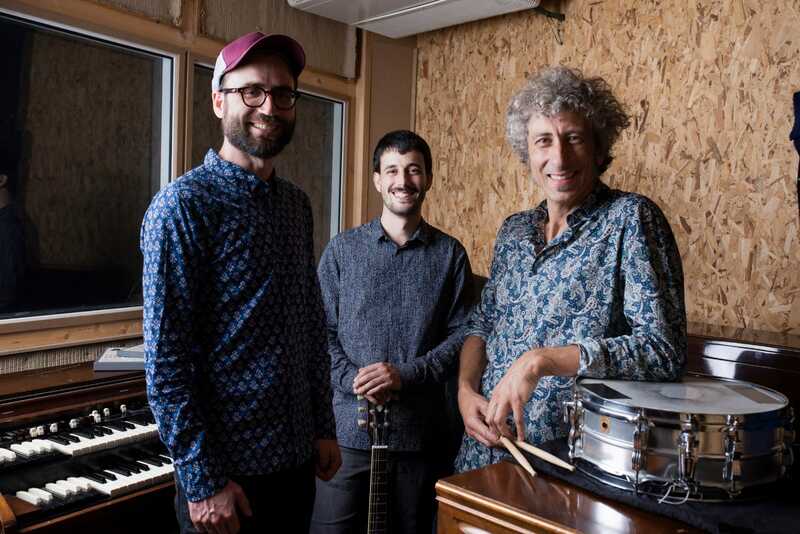 The trio are completed by three caught-after Madrid-based musicians; Gabri Casanova (Hammond), Lucas de Mulder (guitar) and Antonio “Pax” (drums). Having between them played with artists including The Sweet Vandals, Chip Wickham, Speak Low and Mighty Vamp, they bring electricity to the forefront when working together. Ahead of the release on 26 April, we chat to Beat Bronco Organ Trio about making music and working with Chip Wickham. \\ Tell us about the formation of the band, how did you come together? We are each other’s biggest fans and we have know each other for a long time. Last summer we got together for some shows and the whole thing turned out to be fun and interesting, so we decided to record a couple of tunes with the idea of releasing a 7”. Ivan and Philippe [Rocafort Records] contacted us with a solid offer to release the 45, and in no time our debut single became a reality. Can’t be more happy. \\ ‘Easy Baby’ is a great debut, can you tell us about the story behind it and it’s B-side? Gabri and Lucas are great writers; everybody brought different tunes to the table and we just had to decide which one fit the sound of the combo, which is very eclectic. We all agreed on “Easy Baby” as the perfect candidate. On the flip side there is a Gabri’s original killer tune, ‘Geriatric Dance’ which makes the perfect B-side for groovy Hammond lovers and dance floor fillers. \\ Tell us about working with Chip Wickham? We’re fans! Everyone in Spain is a big Chip Whickhan fan and we have all jammed together on many occasions. Gabri worked with Chip on the fantastic band Blue Mode in the past. Concerning Chip’s current solo project, I play the drums – and easy vibraphone parts – on both records and Gabri plays piano on ‘La Sombra’, the first record. \\ What other Madrid based artists should we know about? Who are you listening to? In Madrid we have a lot of incredible bands and musicians. We really like the Sweet Vandals, Aurora & The Betrayers, Cosmosoul, Juno & Darrel, Julian Maeso, etc. We listen to the classics: Lonnie Smith, Boogaloo Joe Jones, Bernard Purdie, Grant Green, Jimmy Smith, The Meters, James Brown – but also artists like The Newmastersounds, Soulive, Tom Mitch, The Marcus King Band, Delvon Lamar Organ Trio, Vulfpeck, The James Hunter and others.